The rumor that all US carrier versions of the Samsung Galaxy S III will carry double the RAM of the international version totally materialized. We glimpsed quickly at the specs on Verizon, AT&T, Sprint, T-Mobile, and US Cellular websites, and all of them are listed with 2GB of RAM, making the rest of the world but Korea jealous with the versions that US got for a change. Granted, the American variants are with a dual-core Snapdragon S4, instead of quad-core Exynos, but benchmarks show that it is probably not that much of a tradeoff, since the S4 is on 28nm, not to mention the multimode radios integrated with it. The 2GB of RAM was said to be added in the last minute by Samsung, as it wasn't exactly sure what will be unveiled with Android 4.1 Jelly Bean, and wanted to future proof its best and brightest to date. As it turned out, they shouldn't have worried, as Jelly Bean doesn't require anything more than ICS does, but we as consumers profited in the end. Hey Samsung, YU dont put 2gb RAM globAlly?? Point of having 2G? Android wipes anwyay the less important (the oldest) applications in memory. Android OS is around 200 MB, add touchwiz - end. It is still a bottle neck thought. I count the international.is more fliudent and jerky then than the US one I guess because all the Ram is there and extremely fast however not enough horse power to run the device. I was wrong willing to take 2ram with dual.core over quad core but after compare the international vs US version I want the both world quad cores with 2gb Ram. 1 international sgs3 is powered by quad core exynos made in 32nm hkmg! 2 it has better battery life (look gsmarena) and faster browser 3 tegra3 is in 40 nm anyway, not in 45nm! 4 get your facts straight! Wait the gs3 runs exynos right ? Why the article says tegra 3 ? Quad core Tegra 3.... International Galaxy S3 runs on Exynos Quad 4412 and people, 2GB of RAM is meant for future-proofing the device. As we move into the future, Mobile Apps, especially games will become much more intricate and complex, requiring more mathematical computations. The 2GB of Ram ensures that the Galaxy S3 will be able to store these numbers in much larger mass than say, the ONE X, or any other flagship device currently on the market. Now as far as the intl version vs. the US version, the EXYNOS 4 QUAD probably outweighs the extra RAM on the US version but it is by no means a clear winner. Eh, my Note takes up 400 ish MB out of 732 actual, available RAM, and that's when it's idling. If the S3 is as s**tty about RAM management, the 2GB helps tremendously. You know what you sound like? The people who prophesied that 256MB of computer RAM would last us forever. I don't know where s**tty RAM management comes into play, the CPU and storage memory are responsible for loading data onto RAM, one of which are more advanced in the S3, so your situation is an impossible one. Someone with lots of widgets and lots of open apps greatly benefits from the extra RAM and refer to my first comment as to why extra RAM will some become critical to ensure system stability and flexibility. 2GB was added to the S3 to ensure optimal space for Jellybean, what does that say to you? Run some kickass games smoothly, that's what. If you don't like 2GB you can always get One X, it has 1GB. Higher end games require not just a faster processor but more RAM if you know anything about computers, cell phones now a days aren't any different. 2GB allows apps to run more smoothly and your phone has to use less power and less freeze ups and force closes. Many reviewers say International Galaxy S3 is a "little" bit fluid & faster & has a little better battery life..
Exynos destroys everything still when it comes to processors and of course it has better better life. LTE is a huge battery drainer and most of them are using LTE when they do these reviews. I haven't gotten any confirmation that the Sprint version actually has 2g. Nothing on they're web site states that it does. If it did you think they would have used this as a major selling point but they fail to mention it all. I actually called the store here and the sales person stated that it was 1gb. But that doesn't really mean much since at times they're a little uniformed. Hey samsung can u make the phone with RAM slot so can upgrade the RAM in thefeature like pc is? The Korean variant of the S3 is the best phone on the market - Quad Processor, 2G RAM and LTE connectivity. I'm upset that this isn't coming to America. Because carriers here systems isn't equipped to work with quad processors. 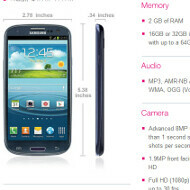 I really care about when the 32 gig s3 for t-mobile will start hitting the shelves. If I don't see it by Saturday, I'll have to settle for the 16 gig.